Networking is a huge part of your event. Many of your attendees hope to meet new people and connect with industry leaders and peers. The easier it is to network, the more enjoyment they get from your event. But networking can be difficult, awkward, and time-consuming. As an event planner, part of your job is to facilitate networking at your event and make it easier for your attendees to connect with each other. Mobile event apps can make connecting with other attendees easier using location beacons, customized connection lists, user profiles, and gamification. 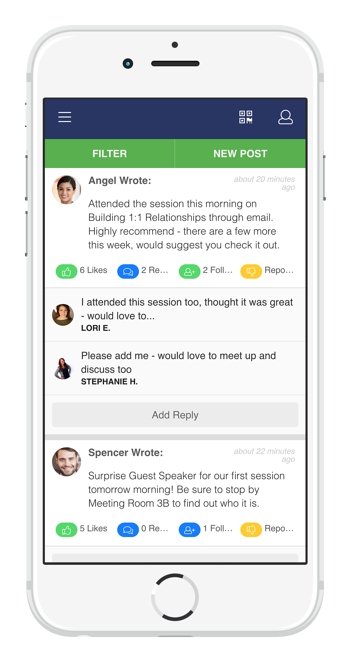 There’s another powerful mobile event app feature that can help your users network. Activity feeds are known for content sharing, but can also facilitate connections between your attendees. Imagine that you’re an attendee at one of your events. You’re browsing the feed when you see a post from another attendee highlighting content that intrigues you. You head over to the area mentioned in the post to check out the content. While you’re there, you meet the person whose post initially caught your attention, as well as other attendees who are also interested in the same topic. It’s simple networking driven by your social feed. When people can congregate around a shared interest, networking is easy. Attendees may have an idea of who they want to meet when they first arrive at your event. If you’re using a mobile event app, you can make networking even easier with customized networking lists and gamification. But activity feeds also help your attendees discover new connections. When your app users notice interesting posts on your feed, they can also meet the attendees who posted the content. This passive introduction can help your attendees find people with shared interests, similar titles, or interesting points of view, who they may not have noticed otherwise. When an attendee notices someone’s interesting content on their feed, they have the added benefit of knowing what that person looks like. Seeing someone’s face makes it easier to find them in a crowd and can provide an easy introduction when they meet for the first time. Take every opportunity to facilitate connections at your event. Add value for your attendees by taking the work out of networking. Use mobile event app features like activity feeds to keep your attendees engaged and interacting with each other. Reach out to us for more great ideas on how you can help your attendees make valuable connections at your next event.